Today I am going to learn basics of AngularJS and hopefully will be creating a very simple application using it. This blog is live feed of my AngularJS learning experience. I will be using bower as well in this blog. I know I can’t cover AngularJS in one day so I will be spending multiple days on it but will cover different topics within AngularJS. Use the way you want. You can use it to build Single Page Web applications. There are lot of challenges when you build SPA applications like Routing , Ajax calls , data binding , caching , history , dom manipulation. 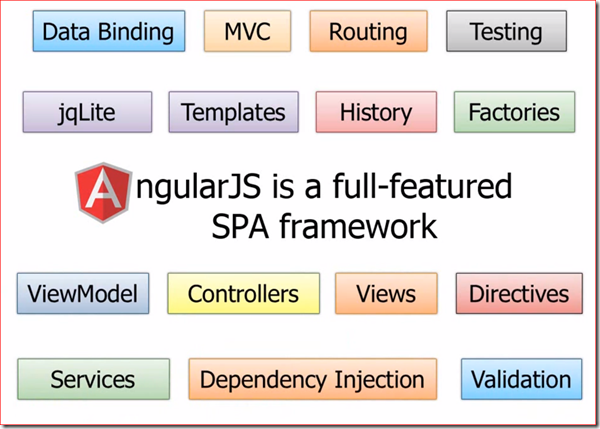 AngularJS provides all these functionalities are built into AngularJS. Controller : Code behind the view. Scope : Contains model data. Glues controller and view. Module : To define new services or use existing services , directives , filters , and so on. Modules can depend on another modules. Directive : All you to extend HTML by defining your own project specific HTML directives. They teach HTML new tricks. For me there are two main reasons why I care about learning AngularJS. Full Stack framework : This means I don’t have to rely on million other scripts and hope they will work with each other happily. We will use Bower to install AngularJS for our sample application. So, if you don’t already have bower installed then follow my previous blog to learn about bower. Create a new directory called bookshop at any convenient location on your file system. Run the following command to install AngularJS and twitter bootstrap. We will use Twitter bootstrap to stylify our HTML. This will create a folder called bower_components in bookshop directory where you will have all the installed components. Now that we have installed AngularJS lets create a html file called index.html which will be our AngularJS based online bookshop application. If you open this in browser you will see “Your Online Bookshop” being rendered. This is not interesting so lets add some AngularJS magic. In our html tag we have defined ng-app. This initialize AngularJS app and tells AngularJS to be active in this portion. So , in our application it is active for the full html document. The second angular directive that we have used is ng-init. This initializes an array of books array which we can use in our application. The last interesting part is the ng-repeat directive which is used to iterate over all the elements in a collection. Angular would add li elements for each elements. So, if we open this in web browser we will see four books in a list. The above was using data in the form of String array but you can store objects as well shown below. So in the code shown above we create an array of books object. Each book object has name and author. And finally we listed both author name and book name in the list. Angular provides filters which helps format the data. You can use filter for formatting dates , currency , lowercase , uppercase , orderBy , and search based filtering. Below is an example how you can make use filters to uppercase Author name and orderby book name. As you can see above we used orderBy filter in ng-repeat directive and we used uppercase filter while displaying author name. To add search filter add a text box for search input and then use filter filter to limit your results as shown below. The $scope is the glue between controller and view. It gets injected into BookCtrl. Now we add our books array to $scope object which will be visible to our view. And we will change our index.html to use BookCtrl as shown below. Thats it for today’s blog. I have only touched tip of iceberg. I will spending many days learning features of AngularJS. It is an amazing and powerful library. Doing something everyday and tracking that is a really good motivational tool, especially the part where you blog about it. However, there is a possibility of exploring a bunch of things superficially. Yes, that’s true. It is an experiment that I am trying to carry out. I might fail. I might not get into depth on each topic, and I think that’s fine. There will be some topics on which I will spend more than one day. Let’s see how it goes. but the ng-repeat doesn’t work for me. instead of the book’s name. I am running on ubuntu 14.x and use Chrome. Do I miss anything or should I install anything more?